Today was a crazy day. Not the head spinning crazy, just the “nothing went as planned” crazy. That being said, I think the day went really well. All my children still have 10 fingers and 10 toes; though my 3 year old swears her thumb is bleeding to death. My husband loves me, and told me so. I talked to my best friend and laughed more times than I can count. And. . . . . I made dinner in 30 minutes, my children ate it, and didn’t complain (well about the food anyway). Spray large skillet with cooking spray. Over medium heat brown ground beef. Add onion and carrots. Cook until soft, about 3 minutes. Add vinegar, tomato sauce, brown sugar, sugar and season salt. Stir to combine, and cook on medium-low for 20 minutes (after 15 minutes, if sauce is too tangy, add the baking soda). 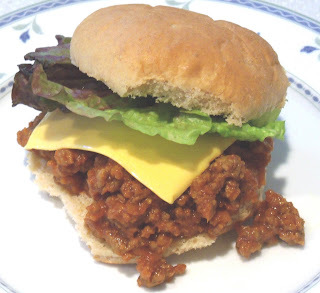 Spoon Sloppy Joe Sauce onto the bottom half of a bun. Top with cheese and lettuce. Serve warm.